Consulting Circles provide specialist training and consultancy services to the health and social care sector. We are dedicated to providing innovative approaches that will enhance the capacity of your workforce to deliver effective recovery orientated interventions within the substance misuse field. Our trainers are C&G 7303 qualified and we insist they have the relevant experience and knowledge of the training they are the delivering. This allows us to directly relate theory to practice whilst offering delegates an experiential view how interventions can be applied. 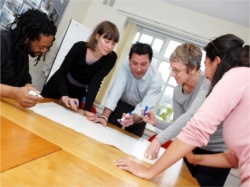 Our staff will work closely with you to determine your organisation’s developmental needs. Our aim is to exceed your expectations by providing bespoke training and consultancy services to fit your aspirations, timeframes and budget. If you wish to be notified of any future workshops and training events please sign up for our mailing list.